Myanmar’s former capital and largest city, Yangon, still bewitches with an impressive array of ancient cultural and historic gems. This includes magnificent Shwedagon Pagoda, one of Myanmar’s most sacred Buddhist sites and a pivotal force in Yangon daily life. Shwedagon contains a 99m (325ft)-high golden stupa and spires, adorned with 7,000 diamonds, sapphires and rubies and allegedly, hairs belonging to the Gautama Buddha. During our evening visit, we join the throng of pilgrims at a special oil lamp lighting ceremony, an ancient and highly symbolic Buddhist ritual. 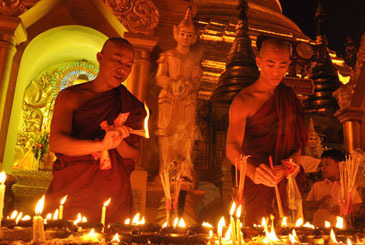 Observe red-robed monks chant ancient Pali scriptures as more than a thousand oil lamps are lit around the gilded pagoda. Our guide explains the meaning behind the chants, helping you understand the ritual. A truly awe-inspiring spiritual experience. We take-in some of Yangon’s fascinating attractions with the first visit to Sule Pagoda, a 2,000-year-old golden temple and stroll through streets lined with faded colonial-era architecture, making a stop at the 1908-built Central Post Office. Continue to Kyaukhtatgyi Pagoda, containing one of Myanmar’s most revered reclining Buddhas – and at 70m (230ft)-long, one of the country’s largest. We tour the National Museum, one of Myanmar’s most important museums for Burmese art, history and culture. Founded in 1952, the five-storey cavernous museum exhibits an extensive collection of ancient artefacts, art works and historic memorabilia. The jewel-encrusted Lion Throne, which belonged to Myanmar’s last King, is a highlight. Spend time at Bogyoke Market, or ‘Scott Market,’ built in the 1920s under British rule. Contained within a heritage-listed building, this sprawling bazaar is crammed with over 2,000 stalls. Bagan was the capital of several powerful Burmese Kingdoms that constructed up to 4,400 temples between the 11th and 13th centuries. Its oldest temples are reminiscent of other majestic ancient Southeast Asian cities, such as Cambodia’s Angkor Wat. Today, approximately 2,200 of Bagan’s original temples remain standing, mainly contained within the Bagan Archaeological Zone – why Old Bagan is regarded as one of Asia’s richest archaeological areas. 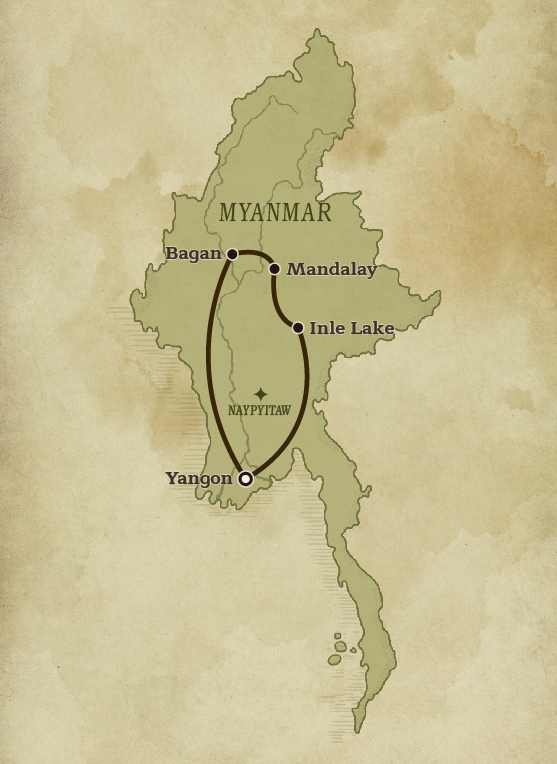 Explore Bagan’s lesser-visited temples by alternative means, automatic electric bike. Weave through jungle paths and off-the beaten trails on this modern form of transport, exploring ancient kingdoms hidden for centuries. 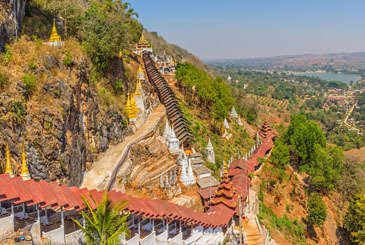 Head to Mount Popa (Taung Ma-gyi), an extinct volcano 1,518m (4981 feet) above sea level. Known as the ‘Mountain of Spirits,’ Mount Popa is the sacred abode to Myanmar’s intriguing 37 ‘Nats’ (mythological spirits). Positioned southwest is Taung Kalat, a sheer-sided volcanic plug, 657m (2,156 ft)-high, with Taung Kalat Buddhist monastery-temple perched at the summit, accessed by 777 stone steps. Making the ascent to Taung Kalat Temple, we pass numerous Nat temples, gilded shrines and white-washed stupas. The adventurous and spiritually-inclined are rewarded with sweeping views of Mount Popa and on a clear day in the distance – Bagan’s temple spires. To learn more about Bagan’s ancient sites and kingdoms, a visit to Bagan Archaeological Museum is a must. The sole museum in Old Bagan, originally established in 1904, this sprawling, three-storey complex houses 2500-plus exhibits representing the magnificent rich history of this ancient capital. Exhibits cover masterpieces of excavated objects,a number of rare Bagan period exhibits, such as original Myazedi lithographed inscriptions, Buddha images dating back 1,000 years and intricate bronze pieces. We are accompanied on a museum tour by an eminent local historian, adding valuable insight to the collections and helping us put Bagan’s history into greater perspective. Myanmar’s last royal capital, Mandalay, is considered the nation’s spiritual hub. On the city’s outskirts, explore two former capitals of ancient Burmese kingdoms. At Myanmar’s penultimate royal capital, Amarapura (‘City of Immortality’), we visit Myanmar’s largest monastery and most prominent monastic college, Mahagandayon, where over a thousand monks live and study. Continue to Ava (or Inwa), which preceded Amarapura as Myanmar’s royal capital from the 14th to the 19th centuries. We take a traditional horse-drawn carriage to Bagaya Kyaung, a teak wood monastery originally built in 1834, which still serves as a monastic school; the Burmese royals were educated here. Our day concludes watching the sunset from 200-year-old U-Bein Bridge, the world’s longest teak bridge, originally constructed in 1782. 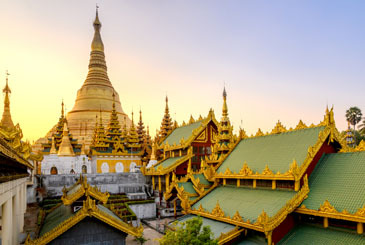 Beyond Mandalay, visit Mingun, home to an early 19th century bronze bell weighing over 87 tons, the ‘World’s Largest Hanging Bell.’ Continue to all-white Hsinbyume Pagoda; its wave-like, tiered terraces modelled after mythical Mount Meru, a striking departure from pagoda norms. At Mandalay’s Daw Ma Ma Naing Marionette Theatre, learn how to create – and manipulate – a traditional marionette, tutored by a master puppeteer. Afterwards, the theatre’s co-founder and celebrated marionette performer, Daw Ma Ma Naing, explains the history of this once popular art form. Head to Shwenandaw ‘Monastery, built by the last Myanmar King, renowned for its exquisite teak wood carvings of Buddhist myths and traditional architecture. At Kuthodaw Pagoda, known as ‘The World’s Largest Book,’ marvel at the 729 marble slabs inscribed with Buddhist teachings. Head from Inle Lake for nearby Pindaya, best known for its massive limestone cave system and important Buddhist pilgrimage site. On Pindaya’s north-to-south ridge, there are three caves, however, only the southernmost cave can be entered and explored. This is where we hike along a well-trodden path that leads to the rear of the cave, where amongst cavernous interiors, pilgrims have deposited over 8,000 gilded Buddha images over the centuries. 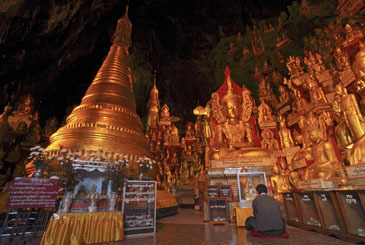 In fact, every inch of the caves are crammed with Buddha images in diverse forms and from different eras. Some of the older statues date back to the late 18th century and the tally grows as pilgrims continually add more. Amongst the images, observe a number of shrines, besides impressive stalagmites and stalactites. Spend a full-day cruising Inle Lake, at 22km (13mi) long and 11km (7mi) wide, Myanmar’s second largest lake. Nestled in highlands, this freshwater lake is also one of its highest. Serene Inle Lake is home to rich flora and fauna and more than 200 floating villages. In a wooden canoe boat, leisurely glide past amazing floating gardens and Intha fishermen, who deftly row their boats with one leg wrapped around an oar. On Inle’s western shores, we disembark at Shwe Inn Thein Paya, a sprawling hillside complex terraced with hundreds of Buddhist stupas, mostly constructed in the 17th and 18th centuries. Some of these mystical-like stupas are still intact, while others are crumbling ruins. We also stop at Phaung Daw Oo Pagoda, the lake’s most revered site, containing five ancient gilded Buddha images. The ethnic Shan group have inhabited this ‘Shan State’ region for centuries, and today, mostly maintain a traditional lifestyle. Shan cuisine is distinct from other Burmese dishes, using indigenous produce and infused with a Southern Indian-style spiciness. Learn how to cook authentic Shan dishes with the hands-on guidance of a local chef. Select key ingredients at a local market, before the cooking class and sit-down lunch. Later, explore Inle Lake’s shores, cycling through traditional farming communities mainly inhabited by Shan and Intha peoples. Our bicycle tour concludes at Red Mountain Estate, one of Myanmar’s two wineries, renowned throughout Asia for cultivating the finest Moscato grapes outside of Europe. Tour the wine-making facilities, before tastings of home-produced Chardonnays and Merlots at the Estate’s mountainside restaurant. Our final evening is to experience a sensory overload on this guided walking tour through Yangon Night Market, a relatively new, night bazaar stretching along the city’s Strand Road. Walk past the never-ending strip of vendor’s stalls and street food carts, piled with a staggering array of Burmese street food and favourite dishes. Our guide will provide insight into the neighbourhood history, besides introducing some typical snacks and delicacies to sample. This vibrant night market also lends a great opportunity to interact with the many local families who eat here.